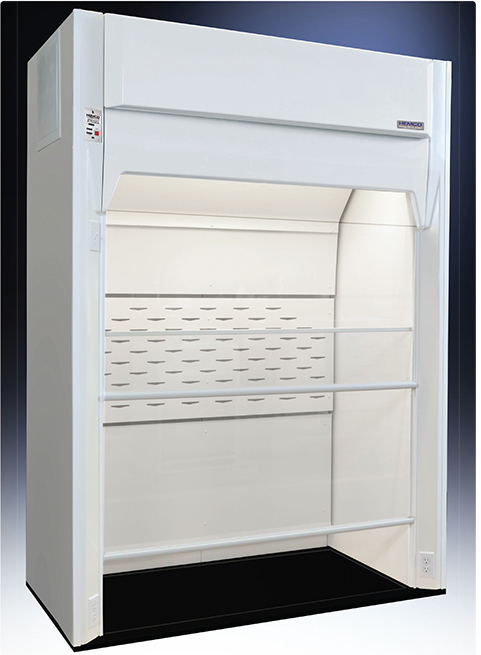 UniFlow SE FM , & LE FM Floor Mounted (Walk-In) hoods, in sizes 48", 60", 72", 96", & 120" & depths of 30", 36", and 48". 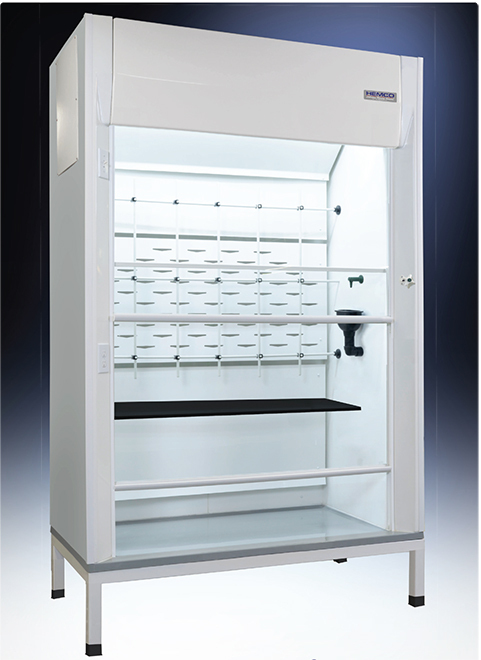 UniFlow Walk-In hoods are available in custom sizes to meet various applications and are ideally suited for synthesis, & other rack type operations where tall apparatus is used or equipment is rolled into the work area. Modular construction can be shipped disassembled for on-site assembly. UniFlow Superstructure to be non-metallic FRP composite construction for total chemical resistance (NO RUST) superior durability and long life. Interior fume chamber to be glass-smooth with Vector Baffle System & bell shaped exhaust collar. Modular construction reduces weight for ease of installation. 62” Sash Height for viewing of fume chamber, loading and unloading equipment for set up. Includes upper and lower sash. 82” Stand Up Height for ease of access and interior depths of 24”, 30”, and 42” available. Energy Efficient vapor proof LED light fixture with polished stainless steel reflectors, and light switch on left column, all factory installed. UniFlow SE FM Hood Cat. No. 11060 shown with vertical rising sash and optional worksurface. 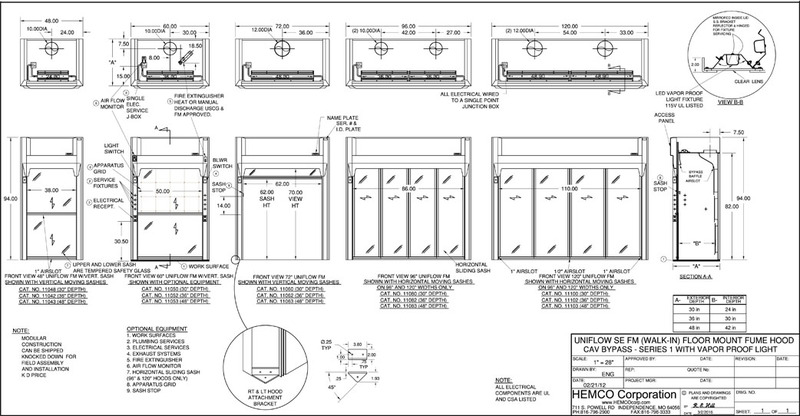 STANDARD VERTICAL SASHES for HEMCO fume hoods,4',5',& 6' wide. The sash may be lifted to the completely open position for maximum access thru the fume chamber. Sash stops available. 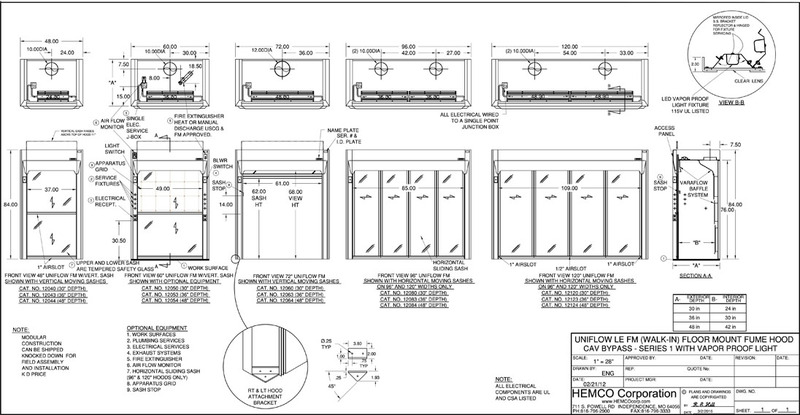 HORIZONTAL SLIDING SASHES For HEMCO fume hoods, 8' 10', & 12' wide. 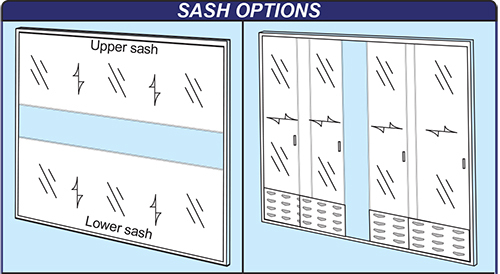 The maximum sash opening for the horizontal sash is 1/2 that of the vertical sashes. The smaller opening, means less air exhausted resulting in energy savings. 2. UniFlow SE Fume Hood with VAV:Same as #1 above except equipped with Variable Air Volume VAV restricted bypass feature in place of CAV bypass feature. Ducting must be connected to optional VAV exhaust system controls. 3. UniFlow SE Fume Hood with Explosion-Proof Light: Same as # 1 above except equipped with explosion proof vapor tight light fixture. Class I Div II Group A B C & D, Class II Div II Group F & G, 115/230V, 50/60Hz U.L. listed Fixture is installed but must be field wired to local codes. 4. UniFlow SE Fume Hood International Configuration: Same as #1 above except equipped to comply to international electrical configuration. 220V/50Hz AC. Optional international electrical configuration, electrical switches, receptacles and exhaust blowers available. UniFlow Superstructure non-metallic construction, total chemical and corrosion resistance (NO RUST)superior durability and long life. Interior fume chamber to be glass-smooth with Vector Baffle System & bell shaped exhaust collar. Modular construction reduces weight for ease of installation. Includes 5 year warranty. Vector AireStream Baffle System, to the exhaust collar. Air Flow Monitor (Optional equipment) continuously monitors face velocity air flow, meets ANSI and OSHA requirements. . Proof Light:Super structure to be modular composite chemical resistant FRP non-metal construction. Interior fume chamber to be glass-smooth with bell shaped exhaust collar. Picture frame upper and lower sash opening with counterbalanced upper and lower sashes of clear tempered safety glass with chemical resistant PVC framing, track, and aerodynamic sash lift. Vapor proof LED light fixture and control switch are wired to a single point junction box. 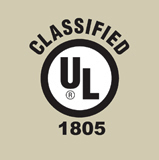 115/60Hz, AC All electrical components are U.L. listed. 2. 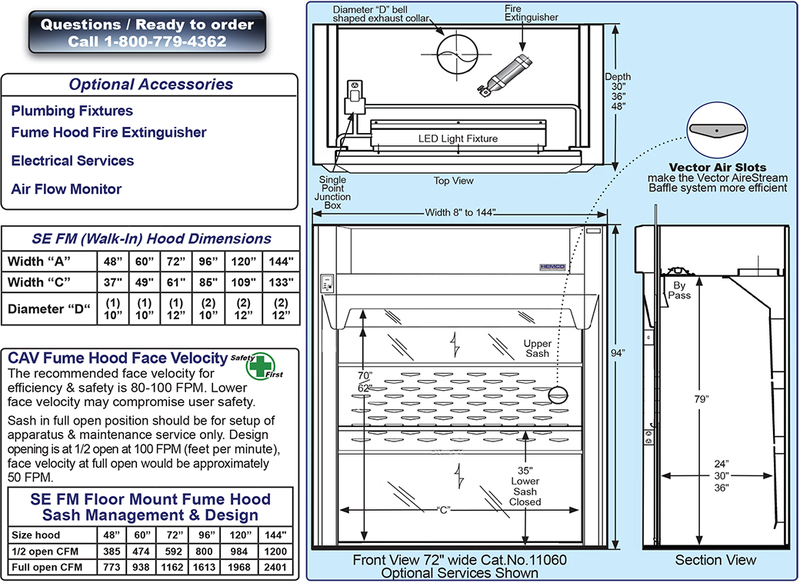 UniFlow LE Fume Hood with VAV: Same as #1 above except equipped with vapor proof light fixture and VAV. 3. UniFlow LE Fume Hood with Explosion-Proof Light: Same as #1 above except equipped with explosion proof vapor tight light fixture. Class I Div II Group A B C & D, Class II Div II Group F & G, 115/ 230V, 50/60Hz U.L. listed fixture is installed but must be field wired to comply with local codes. 4. 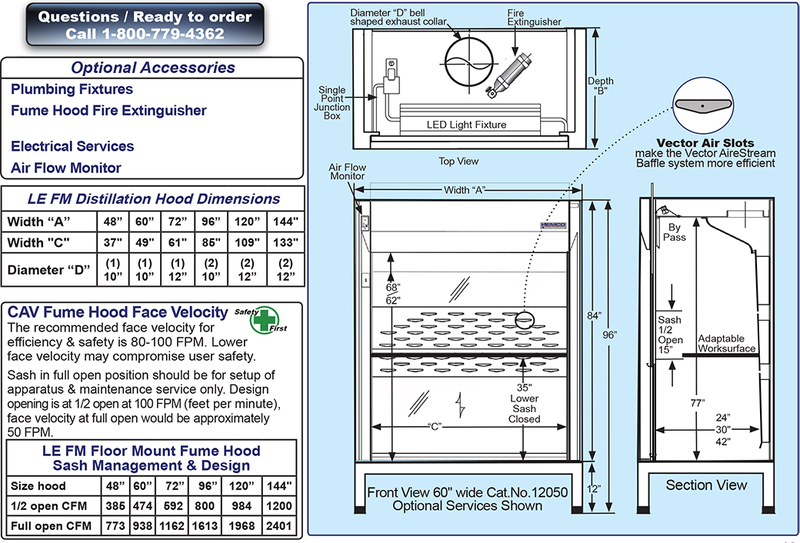 UniFlow LE Fume Hood International Configuration: Same as #1 above except equipped to comply to international electrical configuration.220V/50Hz AC. Optional international electrical configuration, electrical switches, receptacles and exhaust blowers available. 5. Distillation Base Table: Heavy duty welded steel tube table with chemical resistant epoxy powder coat finish, and dished phenolic resin worksurface. Offered in 12" height. 7. Adaptable Worksurface phenolic resin worksurface is provided to slide into place at desired height. Can then be removed for larger equipment.